Does serving cold beer in a frosty mug kill the beer's flavor? Sometimes I get beers served in a frozen glass at a bar, but I’ve heard that this kills the flavor of the beer. When I’m drinking at home, how cold should it be? Damn those frosty mugs! At some point decades and decades ago, beer companies convinced Americans that ice-cold is the only temperature at which to drink lager. (In Germany, for contrast, pilsners are often served around 45 degrees Fahrenheit.) My grandfather insisted on drinking his Molson this way; we’d have to stick a big glass stein in the freezer an hour before he arrived for family parties. This isn’t advisable. The Brewers Association’s Draught Beer Quality Manual cautions against such frozen mugs, which create ice crystals that cause beer foaming problems when you’re filling the mug. Plus, ice picks up the flavors of other stuff in your freezer, which can be... ew. Moreover, cold temperatures make it harder to taste beer’s flavors. That doesn’t mean you should never drink a cold beer—when I’m at a beach in the summer, I definitely want my Coors Light can to turn blue as the Rockies. If you find ice-cold beer refreshing and thirst-quenching, sure, chill it all you want. But if you’re drinking a beer at home that you really want to taste, it’s best if it’s not ice-cold. Here’s what I do: Remove the beer from the fridge about 15 minutes before you want to drink it, and let it warm up slightly at room temperature. 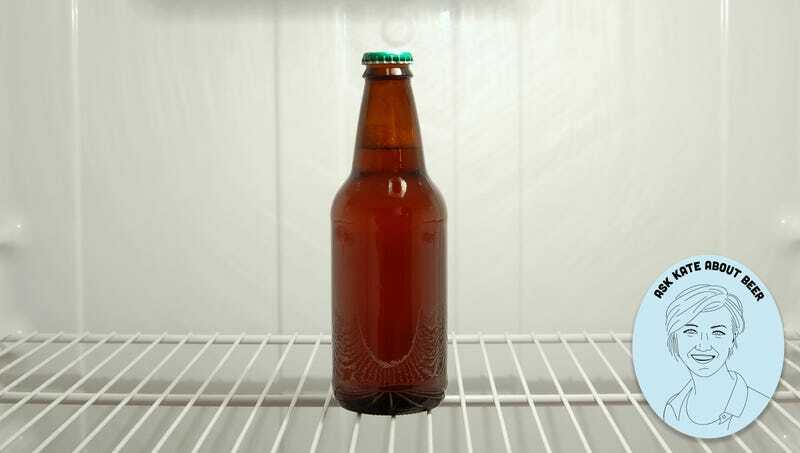 Sometimes when you’re hosting a party, this isn’t practical, but when I’m just drinking a beer at home or with a couple friends, I’ve trained myself into the habit of pulling a beer out of the fridge a bit in advance. Some big beers, like imperial stouts, can be served even closer to room temperature. A few breweries have taken to labelling their beers with the ideal serving temperature, which is fine if you can discern exactly what 50 degrees feels like. But I generally just give those bigger bottles an extra 15 minutes to warm up, bringing the total out-of-fridge time to 30 minutes. And if you’ve been aging a bottle in your cellar at a cool temperature, it’s probably good to go straight away. Oh, but no matter the beer’s temperature, please make sure the glass you’re pouring it into is clean.